Groveland, CA is a gateway community of Yosemite National Park, located off of HWY 120 in the Sierra Nevada Mountain Range. The town got its start during California's Gold Rush and it is still home to Gold Rush era hotels and lodges, saloons and beautiful historic buildings. YFA's Local Events page was created for visitors that are looking for exciting evening activities to enjoy during their Yosemite vacation. Come out and experience live entertainment, great local speakers, farmers markets and let your heart get captivated by one of the original Southern Gold Rush towns. The Evergreen Lodge ​is pleased to present FREE live music throughout the year. Musical acts range from local favorites to regional and national touring bands who are making their mark on the music scene. They love to share all sorts of music, from bluegrass to soul, disco to rock, cover songs you can sing and dance to, and original works of art that will be brand new to you. 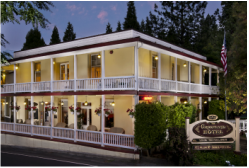 The Groveland Hotel's very own Yosemite Courtyard Cabaret provides live musical entertainment all summer long. A variety of top tribute artists perform with acts as diverse as Elvis, The Eagles, The Beatles, CCR, Johnny Cash, and The Andrews Sisters. Visitors can head over to the hotel to laugh their socks off with live comedy or wonder what came first during the live magic shows, the rabbit or the hat? 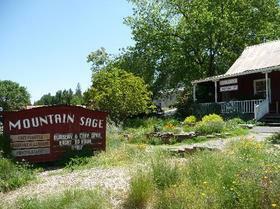 ﻿Mountain Sage isn't just home to the Robb Hirsch Photo Gallery, Mountain Sage Nursery and the Mountain Sage Cafe, it's also home to some of the best live music in the Sierra Nevada Mountain Range. Come out for an exciting night of music from the likes of Hot Buttered Rum, The Trespassers and Brett Dennen or wake up early and try local produce from local farms at the Famers Market. Fresh, organic coffee and tea, wonderful community speakers and great local art work await every adventurous traveler.